St. John's won the Legends Classic on Tuesday night at Barclays Center with a thrilling overtime victory over VCU, 87-86. 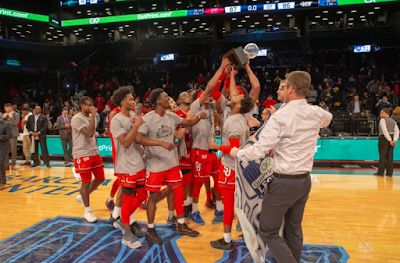 Shamorie Ponds led the way for St. John's once again, as he poured in 35 points to take home tournament Most Valuable Player honors. Combined with the 32 points he had against California on Monday night, his 67 points were a tournament record. Ponds shot 11-25 from the field, including 1-6 from behind the arc, and was 12-15 on free throws. He had 16 points in the second half, the same total he had on Monday night, and nine in overtime. With St. John's trailing by one and 10 seconds left in overtime, Ponds took the inbounds pass and went the length of the floor, driving to the left past three VCU defenders to hit a running jumper and give them an 87-86 lead. VCU elected not to take a timeout, and Marcus Evans got off a good look from just inside the halfcourt line, but it fell short, giving St. John's their first early-season tournament win since the Great Alaska Shootout in 2011. St. John's came from behind against California on Monday night and they came back from an eight-point deficit in the second half to outlast VCU. In addition to Ponds' heroics, Figueora continued his strong start to the season, as he scored 15 points on 6-10 from the field, including 2-4 from behind the arc, with 9 rebounds and 2 assists. Marvin Clark had 10 points, 3 rebounds, and 3 assists, while Mikey Dixon had 10 points on a perfect 4-4 from the field (2-2 on three-pointers) and 2 rebounds off the bench. VCU was led by Isaac Vann, who had 30 points on 8-14 from the field, 4-7 on three-pointers, a perfect 10-10 on free throws, with 11 rebounds and 5 assists. VCU was able to overcome 13 turnovers to take a 36-31 lead into halftime, and they opened up a 47-39 lead in the opening minutes of the second half on a three-point play by Marcus Evans. St. John's responded with a 7-1 run capped by a Ponds layup, and then he drained a three to pull them within a point, 52-51, with 12:48 left. It went back and forth from there, and VCU took a three-point lead, 72-69 with 1:58 left on a De'Riante Jenkins jumper. Ponds did what one would expect him to at this point, as he got a layup with 1:05 left, followed by a steal with 32 seconds left leading to another layup to give St. John's a 73-72 lead. With the shot clock turned off, VCU's Evans took it to the hoop with five seconds left and was fouled by Ponds. After Evans drained one of two at the free throw line, the game was tied at 73 with 5.4 seconds left for St. John's to get the winning shot. St. John's came up with one of the most imaginative, out of the box plays in that situation. Justin Simon threw the inbounds pass the length of the floor to Figueroa, who fired it back to Clark at the three-point line, and he just missed wide right. If Clark hit the three to win it, that would have been the play of the night. In the overtime, St. John's overcame a three-point deficit, led by the nine points from Ponds, five of which came at the free throw line, and including the game-winning runner with four seconds left. St. John's will be back in action at Carnesecca Arena next Tuesday at 7:30 p.m. against Maryland Eastern Shore. THIRD PLACE GAME: Temple beat California, 76-59, to win the consolation game of the Legends Classic.